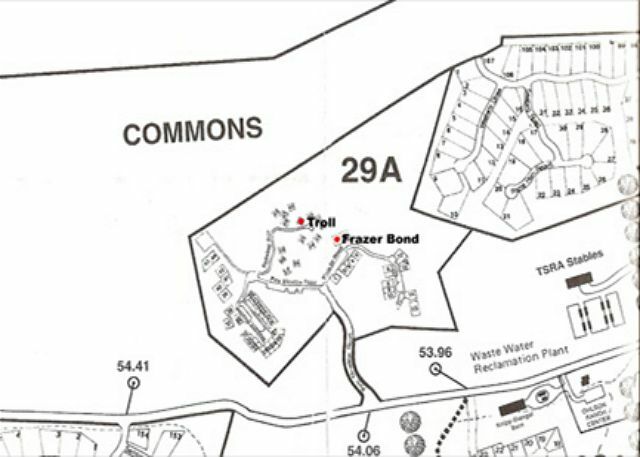 Unit 29A Lot 49 (TOT ID #2184) Forest / HIGHLIGHTS: Lots of quiet privacy. Close to forest trails and the Ohlson Recreation Center. FLOOR PLAN: Exterior stairs up to house. Open floor plan between the kitchen, dining and living rooms with a full bath, (shower only). Up staircase to loft bedroom. Rooms Sleeps 2, Master bedroom upstairs, twin in niche in wall. The property and service exceeded my expectations in every category. I stayed with two young children and they loved it too. We've stayed here many times, and always enjoy it. The redwood cabins are probably our favorite spot in Sea Ranch. My only complaint (a minor one) would be: it would be really nice to have a retractible shade installed over the skylights in the bedroom. During the summer especially, those skylights are like a fesnel lens and the bedroom ends up being 20+ degrees hotter than the rest of the house. One of the other redwood cabins we used to stay in has one of those, and it works very well. We loved the casual homey family vibe of the cabin. It is very simple, barebones, but with cozy blankets and a great sound system. You feel as if you are perched in the trees. Plus, the walk-in cabins adds a camping vibe and makes you feel isolated and relaxed. We knew what this "cabin" would be like as we used to live at Sea Ranch. One must be prepared for a bit of a walk from the parking area (after dropping off your stuff), a flight of stairs. The house was cozy..wood burning stove, comfortable furniture. It would benefit from being less cluttered. The best feature is the 2 huge skylights over the bed...stargazing ! We were able to get 3 nights for the price of 2..a good deal! Yes, we will return. My husband and I enjoyed our stay in this nice little house in the woods. 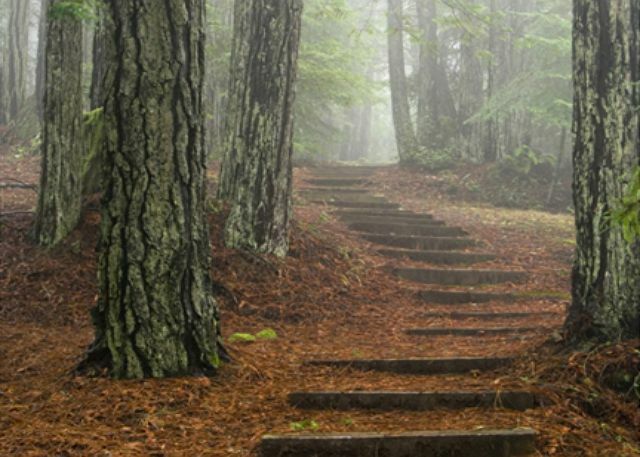 There are several great walking trails nearby. You must park your vehicle and walk to the cabin, which is easily done and adds to the exercise potential. The house itself is small and intimate, but has all the amenities you could want. The skylight over the bed is a wonderful touch. Through it you see not only sky but lovely trees as well. The Troll House is a delightful, comfortable space that makes you feel like you are in a tree house. Huge skylights in the loft bedroom let the thousands of stars help you drift off to sleep. The quiet can't be beaten and the opportunities for relaxation and/or activity are abundant. The description of this property was totally accurate. It is a charming house, with a very 'homey' feel. I felt comfortable as soon as I walked in. 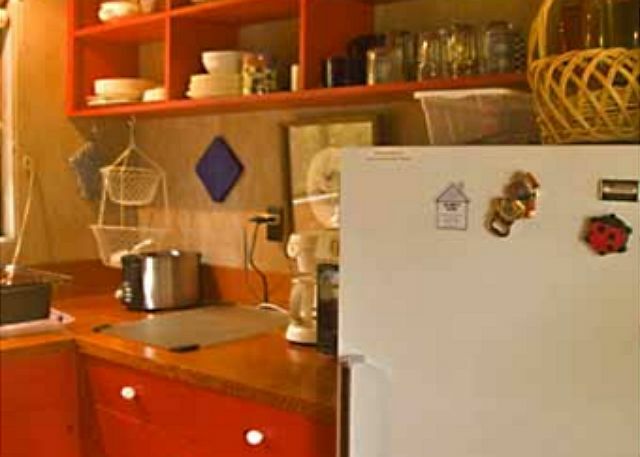 It is stocked with everything you need as far as kitchen items, towels, etc. The pictures and knick knacks around house are charming! The tree coming up through the porch is so cool! Making reservations was easy, and check in a breeze. Kara was welcoming, super friendly, and gave us a few tips on where to go and how to get there. I could not have asked for more. I will be returning to Sea Ranch very soon! As always we had a wonderful time in the house & at Sea Ranch; and everyone at Sea Ranch Escape (especially Kara) was so sweet and helpful. This was an awesome stay at a beautiful cabin. Everything was perfect! There wasn't a single hitch in the whole process. We definitely want to come back soon! We stayed for 3 beautiful nights in the troll house. It is up in the trees and has skylights above the big comfy bed. It was hard to sleep because the view of stars and trees and occasional rain was transfixing! The house was very clean and cosy with helpful instructions everywhere. Can't wait to go back and wouldn't hesitate to recommend it to anyone looking for peace beauty and rest. My girlfriend and I needed to get out of the city and experience some fresh air and nature, so we decided to visit northern California. 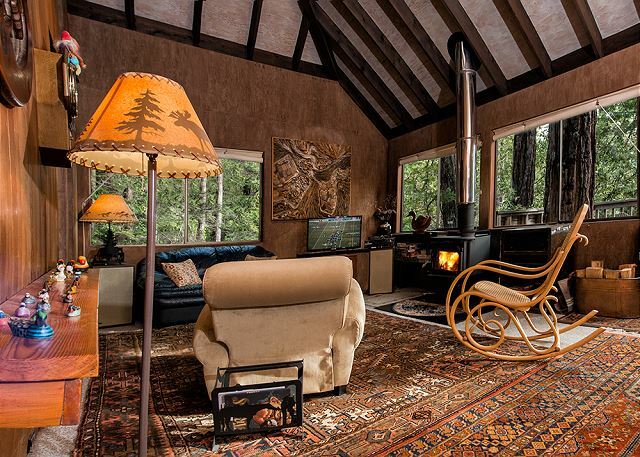 The Sea Ranch is exactly the type of place we were looking for and the Troll cabin gave us a cozy place to relax. Honestly, it's the type of Cabin I would love to own someday. However, my decorating style would be much different. When we arrived at the cabin we then understood why it's called the "Troll". It's decorated with small figurines and dolls throughout. The artwork in general didn't have any real consistent theme, except maybe for "travel". But we're easy going, laid back people, so the strange decorating style didn't bother us too much. We didn't arrive in The Sea Ranch until after The Sea Ranch Escape rental office closed, so they conveniently have a lock box that they'll put your welcome packet and keys in for you to pick up after hours. The same went for checkout. We needed to leave before the office opened, so we were able to simply put the welcome packet and keys back in the lock box. The cabin itself is a 10min walk down to the nearest, small beach on the coast. We went to that same beach twice and both times were the only people there. The Sea Ranch itself doesn't have a grocery store or any restaurants, but the next town north, Gualala, is only a 5-7 minute drive from the Troll cabin. I would 100% recommend this cabin to anyone who wants to have a quiet, relaxing vacation. A lovely cabin for two people, comfortable and with all the amenities for either a weekend getaway or a long vacation. Perfect for two people looking for peace and quiet! Troll house is the perfect getaway for one or two people who are seeking simplicity and quiet. The setting is ideal as you feel like you are in a treehouse and the two giant sunroofs over the loft bed let the twinkling stars lull you to sleep. We've loved staying in Troll House and at Sea Ranch previously, and we did again. Note to other renters: there's always plenty of firewood stacked under the house & a convenient light down there too. The people at SRE are always wonderful, especially Kara. Had such a wonderful time staying at the Trill house. The huge skylight with views of the Stars at night made the whole trip! Loved the seclusion of the cabin even though civilization is nearby. Did a bunch of walks at the beach and relaxed with champagne by the fire at night. Loved it! A beautiful way to celebrate our marriage. We love visiting the Troll! We come to Sea Ranch every January/February and have stayed at this little spot a couple of times. It is just the right size for two people and super cozy! We always have a fire going, make lots of yummy food, and take hikes during the day. The bed is also extremely comfortable. That is one of the reasons we keep coming back to this home. You can lay in bed and see the stars through the sky light. It is truly magical! We were very happy with sea ranch escape. They accommodated us graciously when we were seeking a last minute get away. Our mother daughter stay at troll house was wonderful! Troll house is in a perfect forest location! We lived looking up at the night sky from bed! We felt the tranquility and peace we were hoping to experience at troll house. We enjoyed the hiking trails, swimming at moon ranker and the amazing beaches!!! I would live to visit troll house again!!! Many thanks to sea ranch escape for your hospitality and excellent service! Upon leaving you even provided me with a map so that I could take my favorite route back home. Thank you for the outstanding sea ranch experience!!! Very nice cabin with everything a couple needs for a romantic getaway: full kitchen, music, fireplace, forest/ocean, etc. Amazing bed with a skylight above it. No internet or cellphones. So be prepared for that. The Troll was the perfect size for our little family of 3. It was what we were looking for and we had a great weekend getaway. We had nearly perfect weather but rain in the redwoods would have been nice too. We walked on beaches on the ocean bluff and in the woods too. The cabin was clean and had everything we needed to be comfortable. We stopped at the lodge on Valentine's Day for a drink and enjoyed the staff there too. 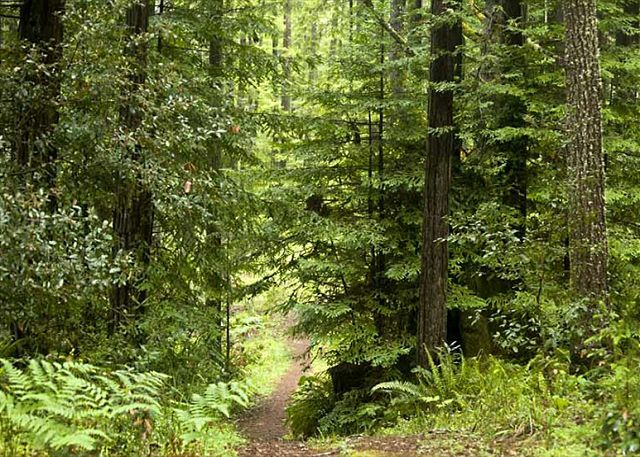 If you are considering staying near the coast, Sea Ranch is the place to go! Love this spot. Would definitely return. Incredible! Calm, cozy, and completely equipped. I could live here forever! I loved the way it had been decorated with the artifacts of the owner's world travels and the location of being amongst beautiful trees and close to trails with exceptional views of the ocean. Definitely going back again! I wanted a place to get away from everything, a place where I could get away from the general noise and disruptions of city life. Going to the Troll House was the best decision I could have made. Situated in the trees, it was nice to able to see the stars, avoid the noise of the cars, have a cup of tea while watching the birds, or lay out in the hammock for a nap. Also, the paths in the area started right behind the cabin, so I never needed to use the car to get to the beach or deeper into the woods. Gualala is close enough if I still wanted a meal out or needed something from the store. For those who want a special experience, the chapel is quite a unique place to stop by and visit. The structure alone is indescribably different, you have to see it to understand. I would recommend turning on some lights if the guest is arriving late at night. It was difficult being so dark. The Troll was so homey and comfortable. Just enough out of the way to feel away from it all yet so close to all the things we wanted to do and see. We slept in under the stars, made delicious meals, and played Trivial Pursuit by the fire. During the day, we wandered the beaches, seeing whales and seals and so many beautiful sights. Can't recommend Sea Ranch and Troll House enough. The only thing that would make it better would be a hot tub! I have rented from three different rental agencies and Sea Ranch Escape was the most friendly and helpful. They included a flashlight in my package when they found I would be arriving late. The cabin was what I had longed for: cozy, supplied with kitchenware and furniture that were pleasing. This is a lovely little cabin with all of the amenities, great 'forest' hiking right out of the door. Comfy, cozy and a great place to get off and stay off the grid. We'll be back. My friend and I loved the Troll house. It's kind of small, so best suited to a couple, but we didn't mind sharing the comfy king sized bed. It was so nice to have the huge network of hiking trails right outside the door! The only problem we encountered was that we weren't able to hook our iPod up to the stereo or tv, but we had plenty of music to choose from on the tv music stations (or CD player and CDs provided). I only wished we could have stayed longer! We had a lovely 5 night stay during a week of stormy weather. Troll House was the perfect place to light a fire, make coffee and read in the living room all day long while listening to the rain and the location was perfect for mini treks to the beautiful beaches when we felt like getting some exercise. A beautiful place to stay! 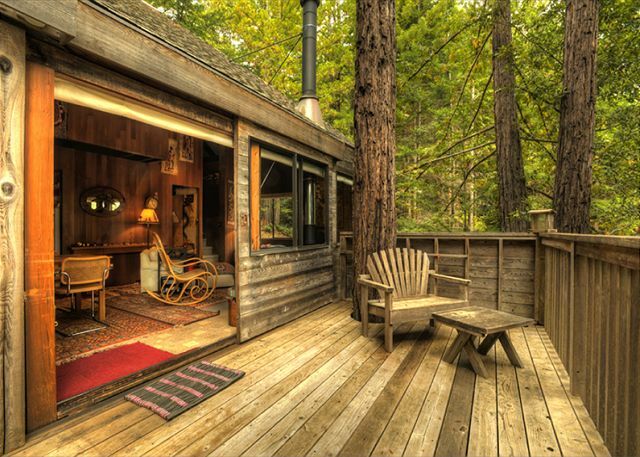 Troll is a beautiful, cozy, quirky cabin nestled in the redwoods. Close to trails for wandering. I spent a couple of days here for my birthday getaway and I can't wait to return. A week at Troll surrounded by rain and redwoods was exactly what I needed to decompress from a fast paced, high stress job in the heart of silicon valley. We love this time of year at the coast with the wildlife and beautiful weather. It was so nice to walk along the bluffs and watch for whales. The Troll was such a nice place to stay. Perfect for a little getaway. It had everything we needed and really was delightful. This is the second time we've stayed in the Troll House. Overall, it's a great location and the house is quite cozy. However, the omnipresent labeling of almost every flat surface in the home has strayed from the helpful to the nearly insulting. Give it a rest. Very cozy cabin for a couple to get away for a few days. Enjoyed it thoroughly. Everything was as advertised. We're hikers so we like the fact there are trails throughout Sea Ranch. Not enamored with having to park the car down the road, but not a big deal. Overall, we had a great time. Had a fabulous stay. Centrally located, enjoyed the Home Tours and hiking trail near the walk-in cabins. The Troll House was an amazing place to stay. Surrounded by woods for miles but only a quick two minute drive down to the beach. We greatly enjoyed Sea Ranch and agreed that the cabin was the best part of the whole trip. We had a great getaway at the Troll House at Sea Ranch. The cabin was perfect for just two people and the setting was rustic and quiet. We felt very spoiled by the serenity. The kitchen had all the right conveniences which made cooking so easy. It was cold at night but a nice fire in the stove made us feel comfortable and cozy. The staff at Sea Ranch Escape was helpful and very professional. They answered our questions and when we arrived and the linens were not there they arranged for their pick up and did not charge us. It was a great four days. Thank you! We were looking for an escape from the regular hubbub. Troll House provided just that. The bedroom, with ceiling skylights, gave the feeling of being in a tree house. Thank you, we will see what other options we have for the light. The cabin was the perfect size, was in a great location and we enjoyed every moment we were there. Thank you very much for a most enjoyable weekend. My stay at the troll cabin was delightful. My family had owned a similar cabin. Just a stone's throw away during my childhood, so I was familiar with the cabin's layout. It was just as charming and tranquil as I remember. It was my wife's first visit to the Sea Ranch and she fell in love with the place. We will definely be returning soon. A very nice, peaceful stay! We loved the Troll house! So close to the ocean and very quiet/peaceful at night! This walk in cabin is perfect for 2-3 people, and is worth the price. We loved the fact that no cars were parked near the cabins (although there was a stray car parked near us.. clearly breaking the rules). We will definitely come back! Great place. Loved it. Small nits - 1. Giant- big spider above wife's side of bed first night. Some commotion. 2.Couldn't get TV to work. 3. Couldn't get FM radio to work. Other than that, lovely. Sunny deck. No coastal wind. Quiet as a church mouse. Would return. Perfect, peaceful getaway for our anniversary. We were scrambling to find lodging for a wedding happening at the Lodge, and the groom suggested we check out SR Escapes. I found The Troll (it was just my fiance and myself) and have to say—we had the best spot of any of our friends at the wedding! The pictures don't lie—it was wonderful. We'd like to come back when we didn't have such a hectic event to deal with, as to try out the trails and other amenities. Nicely situated halfway between Gualala and the SR Lodge, it was s short trip to either destination. The BBQ place in Gualala has some pretty great food, too—that's coming from someone from The City, too! As a couple, you can't go wrong with The Troll, and I have to believe the larger units are just as nice. Lastly: the heard of sheep were the cherry on top. First time staying in one of the walk-in cabins up in the forest. Such a cute little house, perfect for two people! Cozy. Like staying in a tree house. My Wife and I spent a very relaxing pre-Valentine's Day weekend at the Troll cabin, nestled in the majestic redwood forest with peekaboo ocean views and the roar of the ocean. 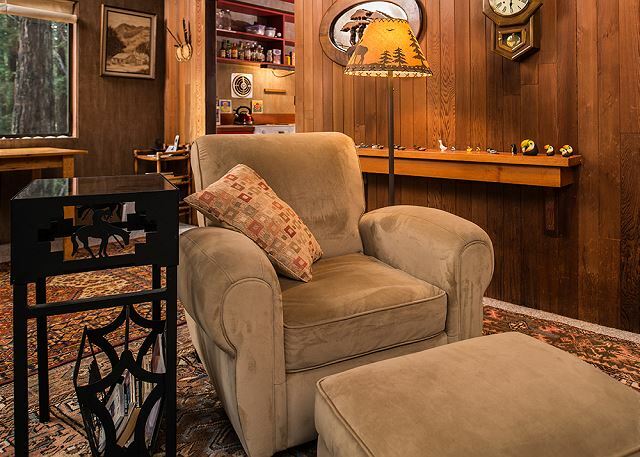 The setting was pristine and the cabin had a cozy, rustic 70s flair. The stay also brought back childhood memories of my stays in my family's cabin, just a stone's throw from the Troll cabin. For the price of a hotel room, the setting of this cabin was a great bargain. I highly recommend it. A week in the woods. Property management staff did not tell me that I needed to display tag on my car. If I hadn't remembered to look for my pool pass and seen the tag I would have gotten the Denver boot. They also need to work on their people skills. How about a greeting, a hello, a welcome? It was just take the money and here's your packet. We loved our stay. Cute little house, the cable didn’t work.. my husband wasn’t too happy about that. They also told us the walk was 100ft without private parking... it was much further than that.. but I didn’t mind it. Overall it was a great stay. 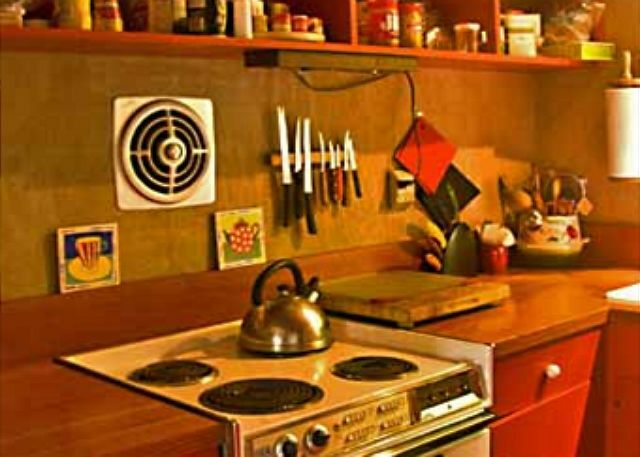 Troll House has been around awhile but had a decently equipped kitchen, was clean and nice size for 2. Nothing luxurious about it but extremely comfortable. Would definitely recommend it for those who love living in the trees. My husband I stayed here for his birthday as a weekend getaway, where we met up with my mother who was staying nearby on a sister's reunion. 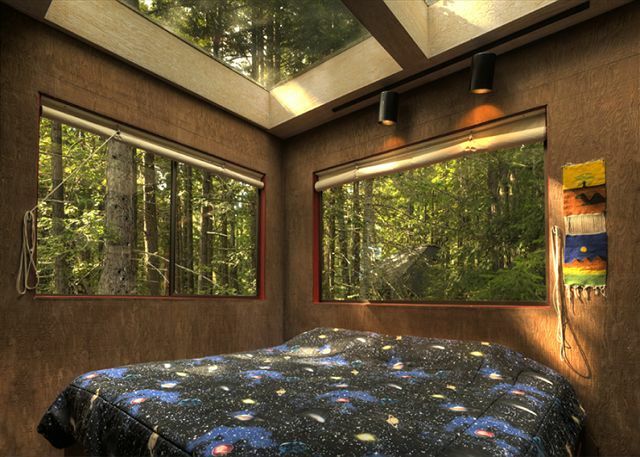 The cabin is very nice and the bedroom skylight to the stars is definitely a huge plus. The area is a little cozy with a teeny kitchenette and loft-style bedroom, but on the upside it meant that the heaters warmed the place rather quickly. 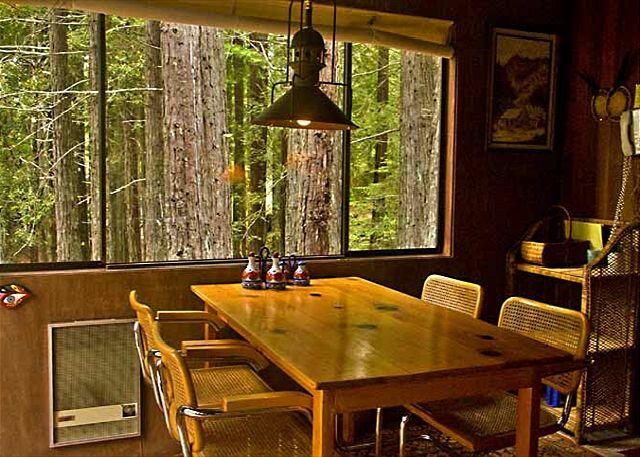 The cabin itself is also very open in terms of having a bunch of big picture windows out to the redwoods, and they're very clear - so clear in fact, that a bird slammed into the front sliding door on the first morning we were there! Luckily, the bird survived and eventually flew off. Overall, we loved the cabin and enjoyed the comfortable bed, the amazing skylight, and the general 'feel' of the place. The one downside that's more with the rental company than the cabin itself is that they charge a hefty cleaning deposit, and if you choose not to go with the deposit, the list of duties you must do upon check-out is kind of outrageous! Granted, your check-out time does get extended as well, and we went ahead and did them and got the full deposit back - but I've literally never stayed at a rental place up in this area (where I've stayed at many places for several years now) where the cleaning expectations were ridiculous and the refundable deposit was so high. Still, if you're responsible about your 'duties', I suppose it's worth it in the end. Our stay at Troll was enjoyable. Lovely strolls through the woods and along the headland bluffs every day. Great vacation spot for truly getting away from the usual experience of shops and stuff to do. A nice place to retreat. Cute place! Two people fill it up! Really lovely setting. Only drawback was the sliding door (only door to the house) was hard to latch. My stay was lovely, the stars at night through skylight came as an unexpected surprise. The sound of waves in the distance and trees, trees, trees. Very nice experience! Great Location and close to 2 fish Bakery..our fav. We had our first stay in Sea Ranch over Memorial Day weekend. The house was clean and comfortable and filled with knickknacks. The location was quiet and relaxing. We loved the wood stove and used it every night. The king sized bed was comfortable, but the rocking chair and other furniture made the area a bit tight. It would have been nice to have been able to use the hammock which smelled like dog and I don't think it had been hung out in years. Comfortable outdoor furniture would be a great addition! Pretty good overall, just wish there had been a hot tub. Bruce B from Napa, CA does not recommend this vacation rental. Been to SR many times and it is always our favorite place to be. The mattress on the bed could use a serious upgrade-it is firm but gave both of us back pain in the am. Negotiating the stairs is fairly dicey in the dark of night. Front door. huge skylight, wood=burning stove, deck and wonderful hammock(my wife did not put up until our last day but what a wonderfully restful last day she had after). Couch is too dam short. Plunger for toilet is inadequate and parts inside the tank were put together in a mickey mouse faxhioin using a paperclip rather than a real plumbing item. the handyman that came to assist us was wonderful and professional. Lastly, two smoke alarms went off almost simultaneously about 3:30 am on our last night and were very difficult to access safely to turn them off. 1. The instructions provided in the office lockbox said to turn from Hwy 1 onto White Fir road, when in fact the turn is onto Pine Meadow road. The map included with the instructions cleared things up, but it confused us for a few minutes. May be helpful to correct the instructions. 2. When we arrived at the house on Redwood Rise, it took 10 minutes to figure out which house it was. All the other houses on the cul-de-sac had address numbers attached to wooden posts along the side of the road; only Troll House did not have one of these. So we had to get out of the car and hunt around with flashlights until we figured out which house was Troll House. The next morning when it was light outside it was easy to tell which was Troll House because the address number is posted on the house itself; but at night when it was dark the house number was impossible to see because it was far above the reach of our car's headlights. So we'd suggest putting another house number on the wooden posts by the road in front of Troll House (i.e. like all the other houses have), so that it's easy to tell which is the correct house if you're arriving at night. 3. Some jerk decided to throw eggs at our car on the evening of Sun 9/2/12. Actually, they threw eggs at all the cars parked in the walk-in parking lots on Madrone Meadow road. It took some time to clean the eggs off. Luckily, it seems that no permanent damage was done to our paint, but it did leave a bad taste in our mouths. The walk-in part made me nervous, but it turned out to be very safe to do alone both day and night and short enough to not discourage me from adventuring out and about. I was even able to walk down to the beach to watch the sunset. It was quite dusty, though. Dust allergies beware! My boyfriend and I booked a last minute long weekend getaway at Troll House and we were very pleased with out stay! We did unfortunately arrive fairly late at night so it was a little challenging finding the property and not so fun walking from the parking spaces to the cabin in the dark(i suggest heading up before dark!). But once we settle in we were so pleased with such a quaint little spot to spend our weekend. The space is a great "no frills" cabin. Clean, perfect for two people, the fireplace is wonderful and the sky lights over the bed are beyond cool. I felt like our location was very central, we were within walking distance from the water and all of the beautiful walking paths along the coast and we were a short drive from Gualala where we visited several restaurants and the surf market grocery store. Overall we had a truly fantastic weekend and will definitely be visiting Sea Ranch again. I Needed a break from everything and after looking at this place several times over the last year or two I decided to make the drive (4.5 hours) , it was so worth it, the drive itself along Hwy 1 was so fun and the house and location were exactly what I expected. The hiking trails are gorgeous, the house was simple and functional, comfortable, wish I could have stayed longer. We had a wonderful and relaxing 3 days foraging for black chanterelles in the woods by day and eating gourmet meals at home by night. Love the skylight to view the stars at night! We enjoyed very much our stay. The cabin was clean, nice, surrounded by woods, and it was very quiet. We'd definitely return in the near future. It was the perfect place to stay for our honeymoon: cozy and personal. Two suggestions: 1) sharper knives; 2)since there are tennis courts available it would be really nice to have tennis raquets (because buying them in town is expensive). Thank you for sharing your lovely piece of California. Very Peaceful location to get away from it all! Our only disappointment was upon arrival to realize several fuses were off/out (refrigerator, stove, microwave and heaters). Unfortunately we arrived late and it was dark and we could not locate the fuse box which was outside the house located on the back corner. We called maintenance and they came out to get us just took quite a bit longer than we planned to get settled in :( Otherwise our stay was great! We really enjoyed sitting out on the deck in the morning. What a beautiful and peaceful location. The skylight was great as well, but we don't recommend sleeping in too late or an afternoon nap as it gets very warm when the sun shines on you!